If the service is one of the Holy Communion, there are other places to focus on our prayer. The most important one is the act of receiving the bread and wine itself. As we go up to receive communion our minds can be full of many things: Are my clothes straight? Are people looking at me? Can I avoid tripping on the step? When shall I go forward? And so on. This is probably inevitable, but at least we can be sure as we wait for our time to go up that we are opening ourselves actively to God, praying for his touch, taking to him our concerns. 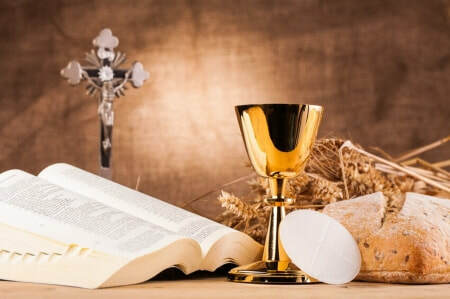 Then when we actually receive the bread and wine, we can intend, in the holding open of our hands, to bring to God all our problems, dilemnas and decisions, together with the emptiness of our hearts, so that they may be filled with the goodness and life of Christ himself. And the only response possible when we have taken the bread and wine into ourselves is to say - thank you, thank you.